I am a pragmatic environmentalist and an Ecomodernist and in celebration of the fourth anniversary of An Ecomodernist Manifesto I have prepared this post to present an Ecomodernist-based approach to fighting climate change while simultaneously protecting our shared global ecosystem. Let’s start with the obvious, but apparently necessary, declaration: I believe that climate change is both real and a significant threat to the long-term ecological health of our planet. That being said, I think we need to take a long and careful look about how we have approached the fight against climate change and how we should be carrying out the fight in the future. My concern is that we have made some poor choices, to date, in the fight and if we are not careful we risk being led down a path that could have consequences almost as bad as if we simply listened to those who deny climate change is real. I write this blog post as someone who has spent almost three decades evaluating policy options to fight climate change from both an ecological and humanist perspective. As a humanist I see the need to reduce human suffering by pulling as many humans as possible out of poverty and giving them the resources to live good and fulfilling lives. This means making more energy available for more people since quality of life is strongly correlated with easy access to energy. From an Ecological perspective, I see a planet where the mass of humanity has inexorably squeezed out nature. I see a need to turn back that tide. As humans we need to reduce our global ecological impact. We need to restore nature not just for human use but because nature has a legitimate right to thrive absent human intervention. We need to make more space for nature and give it a chance to exist outside direct human influence. Returning to the issue of climate change; we currently live in a world where climate policies appear to be more-and-more dictated by high-school students, political operatives and unaccountable international NGOs rather than the scientists and policy experts who have spent decades studying these problems. In that context, I can state that I have never been more afraid. I’m afraid because it is becoming increasingly clear that the idea that we should proceed using defensible and rational policy has effectively become passé. We have let ourselves be convinced that any action is better than our current path and in doing so are embarking on policies that could pose a significant threat to the long-term ecological health of our planet. Now I know this last paragraph sounds harsh, but the truth of the matter is that the climate change debate is becoming one of harsh language, overblown rhetoric and a lot of really bad science. Political activists and unaccountable NGOs are pushing their political agendas under the guise of “fighting climate change” and the result has the potential to derail the real fight against climate change. Consider the “Green New Deal” (GRD). It represents a tremendous aspirational document and yet somehow its supporters simultaneously argue that the GRD requires that the all work be done by unions. The reality is that renewable energy projects do not produce fewer megawatts per hour if they are constructed by non-unionized labour. Placing these kinds of irrelevant restrictions in the way represents the sort of thing that takes away from achieving our goals. In addition to activists adding unnecessary requirements to projects, others are demanding unrealistic and overly expensive approaches or approaches like expanding our use of biofuels even as we have come to recognize that biofuels often make climate change worse. When policy decisions are driven by students, political operatives and activist NGOs (often staffed by individuals with no real understanding of the underlying science that forms the basis of our current society) the results can be changes that can have massive negative consequences. To understand what I mean by well-meaning activists look at the proposals of the 100% wind, water and sunlight team at the Solutions Project. Their idea of a solution to our climate challenges is to industrialize our fragile marine foreshores with low-efficiency wave and tidal facilities while massively increasing the amount of space dedicated to harvesting low-density energy sources (i.e. wind farms and solar facilities). Marine foreshores represent significant and highly-restricted ecological niches and filling them with disruptive human technologies represents an unnecessary burden on those niches. It is hard to talk about bad approaches to energy policy without discussing the German experience with Energiewende. It has shown that you can spend almost $500 Billion and still see almost no decrease in carbon emissions if you make the wrong choices. We need to stop listening to dreamers who don’t understand physics or ecology. The people who demand we depend solely on low-density, diffuse power sources or revert to low-tech, high-input agricultural practices are wrong. Instead let’s look at how an Ecomodernist approaches the problem. The core of the Ecomodernist approach is to decouple human development from environmental impacts. How do they suggest humanity do that? By increasing urbanization; intensifying agriculture; expanding the use of renewable power within the context of our urban environments; and supplementing low energy-density renewables with higher energy-density renewables like geothermal and nuclear power. Serious environmental scholars understand that the best way to preserve nature is to enhance urbanization. Urbanization means putting more people into cities where they require fewer ecological inputs, per capita, to enjoy a healthy and fulfilling existence. In urban communities we can reduce per-capita energy costs through mass transit, shorter travel distances for supplies and shared heating/cooling in energy-efficient, high-density housing. The more spread out your community, the less likely that centralized services like sewer, water and gas are possible and the more expensive the cost to maintain the services. More people in cities means fewer people in suburbs and more space for nature and non-human species. Similarly, our aim shouldn’t be to “go back to nature” to grow our food, rather we should intensify our agriculture while limiting our farming footprint. There is simply not enough land for humans to return to subsistence agriculture. While the 100 Mile Diet sounds intuitively like it should be better for the environment, that is far from the truth. We need to grow our food where it grows most efficiently and in doing so we can use less space leaving more space for ecosystems to thrive outside of direct human influence. Marine aquaculture is a critical consideration on this topic. Our heavy reliance on the natural bounty of the oceans is quickly depleting their ecological diversity. We need to eliminate open-ocean and drift-net fishing. If we must fish then we should rely on terminal fisheries rather than indiscriminate fisheries and we need to use everything that we take. The ecologically criminal practice of discarding bycatch simply has to stop. Moreover, we need to create more marine nature reserves where marine species can re-build marine biodiversity. This means setting aside large expanses of oceans where we simply don’t fish or otherwise exploit the oceans while identifying smaller areas where we can take advantage of the bounty of the sea through aquaculture. Part of the de-coupling involves changing the way we generate energy. We need to wean ourselves off fossil fuels and move toward electricity-based transportation and home-heating technologies. We also need to re-think how we look at renewable energy technologies. Moreover, because they are smaller in size VAWTs can be placed in locations where HAWTs cannot, like the medians of highways. Anyone who has walked near a roadway knows how much wind is generated by a large truck driving by. Now imagine hundreds of small VAWTs harvesting that otherwise wasted energy and pumping it back into the grid. Tests are being done around the world, and the results have been very promising. Our urban environments create massive wind corridors and VAWTs can take advantage of those conditions to generate energy. As for solar energy, we need to re-think how we generate that as well. Our current approach of stripping huge swathes of nature to install solar panels has to be re-thought. We need to make more policy decision like the California rooftop solar mandate and ensure that new buildings don’t just use energy but generate energy. This doesn’t just mean solar panels on the roofs but fully integrating photovoltaics into our building designs. If we do decide to develop stand-alone solar power facilities, we should do so in combination with agricultural uses. We shouldn’t stop with making our buildings energy producers; we also need to incorporate ideas like the the Vancouver Green Building plan that reduces the amount of energy need to keep a building warm in winter and cool in summer. Now the topic where Ecomodernists always get attacked is the recognition that de-coupling human development from environmental impacts means incorporating our most effective low-carbon energy technology: nuclear power. Opponents of nuclear claim it is too expensive, will encourage nuclear weapons development and has waste issues. We all know that the reason nuclear has been so expensive is that traditionally nuclear plants were designed and built as one-off projects. Well, the Koreans and Chinese have demonstrated that by simplifying and standardizing nuclear design we can avoid most of the cost challenges in building nuclear reactors. As for nuclear proliferation, if Canada wanted the bomb we would already have it. As for China, the US, India, the UK, France and Russia? they already have the bomb. Ultimately, I’m pretty sure a new nuclear plant in Alberta won’t be the deciding factor as to whether Canada decides to become a nuclear weapons state. Finally, the waste argument is simply a red herring. Nuclear energy produces much less waste than solar or wind facilities (per MWh produced) and as for the spent uranium, the Generation IV reactors will be turning that “waste” into the next generation’s electricity. Urbanization, agricultural intensification, nuclear power, aquaculture, and desalination are all processes with a demonstrated potential to reduce human demands on the environment, allowing more room for non-human species. Suburbanization, low-yield farming, and many forms of renewable energy production, in contrast, generally require more land and resources and leave less room for nature…..A good Anthropocene demands that humans use their growing social, economic, and technological powers to make life better for people, stabilize the climate, and protect the natural world. As regular followers of this blog know, my graduate research involved developing systems to allow data collected by researchers to be evaluated for reliability and made available for subsequent re-use by other researchers. I carried out my research in an era before the wide availability of computerized statistics programs. As a consequence, all my statistical calculations were done with a calculator and statistical look-up tables. Due to the difficulty in completing these analyses, we were taught some very important lessons about evaluating research studies. In this blog post I want to share some of those lessons while examining the most recent paper from the Ramazzini Institute 13-week pilot study on glyphosate. To do this, I am going to introduce a couple important concepts in science (Type I and II errors and p-values) and then use that information to explain why the study, as designed, could not come to any definitive conclusions. Or put another way, because of the study’s design it is virtually impossible to derive any definitive conclusions from the research and any activist attempting to do so needs to spend more time learning about the scientific method. A Type I error, which represents a false positive, involves claiming that an observed hypothesis is correct, when in reality it is false. 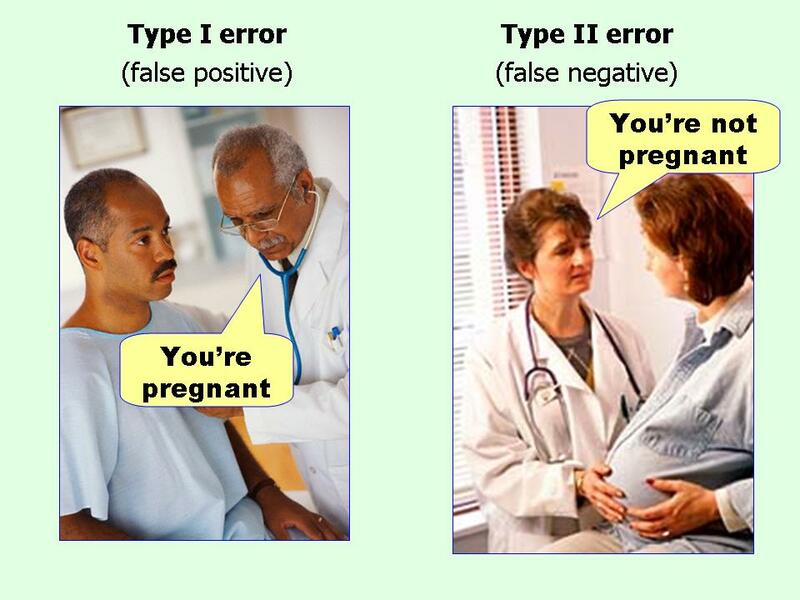 A Type II error, which represents a false negative, involves claiming that an observed hypothesis is incorrect when it is actually correct. In my opinion, the best visualization of the difference between the two is this graphic: (which I have seen in numerous locations and whose origin I have been unable to confirm although I believe it comes from the “Effect Size FAQ“). The tools used to avoid Type I errors mostly involve better understanding the nature and characteristics of the populations under study. It is generally accepted by the scientific community that an acceptable risk of making a Type I error is the 95% confidence level (a p-value of 0.05). In order to derive an acceptable p-value, certain characteristic of the population must be understood. Primarily its distribution, or lack of an understood distribution.The details of how statisticians evaluate populations for this purpose involve mathematics that I won’t go into today. The tools used to avoid Type II errors are less well-refined (but are getting better every day). Most depend on improving our understanding of the nature of the distribution that is being tested. Lacking that understanding an increase in sample size will increase the power of an analysis and reduce the likelihood of a Type II error. P-Values: what do they mean? P-Values are one of the most misunderstood features in research. A p-value helps you establish the likelihood of a Type I error. It does nothing to help avoid Type II errors and has absolutely no information about whether your results are “right” or “wrong”. Remember in science all results are right since they represent observations. It is just that some observations may help support a hypothesis while others may not. As described in this article in Nature, when Ronald Fisher introduced the p-value in the 1920’s he did not mean for it to be a definitive test but rather one tool in the researcher’s tool belt. Nowadays there is an entire edifice in science built on the importance of achieving a p-value less than 0.05 (see a xkcd comic which makes fun of that idea). The problem is that a low p-value is not a proof of anything. A p-value simply provides the probability of getting results at least as extreme as the ones you observed. A really clear write–up on the topic is provided in this link. Unfortunately, even practicing scientists have a really hard time explaining what a p-value represents. As I mentioned above, a p-value indicates the likelihood that an observation supports your hypothesis. At a p-value of 0.05 (95% confidence) we still have a 1 in 20 chance of being wrong (a Type I error). My son loves playing Dungeons & Dragons and in that game 20-sided dice are used for all battles. Roll a natural 20 (a critical hit) and your level 1 barbarian actually hits the other guy’s level 18 druid. Roll a 1 and your level 12 barbarian can’t even hit a wall. Now the truth every D&D player knows is if you roll the dice enough times eventually everyone rolls a 20 and everyone rolls a 1. That is how statistics works. It is also true that speaking from a purely statistical stand-point it is incredibly unlikely that any one person will win the lottery, but eventually every lottery prize gets won. So when someone gets a “significant” result in a study you need to examine how many times they rolled the dice and how well the researcher understood the relationship between the observations and the conclusion. False correlations happen all the time in science and are so common there is a great web site dedicated to the more entertaining examples. This brings us to the the “Ramazzini Institute 13-week pilot study on Glyphosate”. This is a project intended to try and find whether glyphosate has a potential effect on various human health endpoints. This research project appears to have started with the assumption that these impacts exist and so is using a shotgun approach to try to find topics for further study. So what have they done in this study? In the study cited they exposed a relatively small number of rats to glyphosate in two forms, as pure glyphosate and as the Roundup formulation and then did all sorts of measurements and assessment to see if any significant effects were observed. Now remembering what we read earlier look at the paper the number of times they rolled the dice. They generated eleven tables with dozens and dozens of comparisons between the treated mice and the controls. As you can expect, in the end they found a number of “significant” differences, but should we be convinced by this fact? Once again I direct you to an apt comic from xkcd. Well, let’s start with the obvious question: since both glyphosate and Roundup have the same critical active ingredient you would expect the two treatments to have the same effect. So any case where only one of the two treatments had an effect should raise some red flags. From the Type I error perspective, given the number of comparisons that were made, this outcome would not represent anything different than you would expect by simply rolling 20-sided dice. There was one single occurrence where both the glysophate and Roundup significantly differed from the control, but once again given the number of comparisons that is not an altogether unexpected result. How about false negatives? Well from a Type II error perspective, the number of rats in the study are so low as to not really prove anything either. Look at this study of “Pesticide use and risk of non-Hodgkin lymphoid malignancies in agricultural cohorts from France, Norway and the USA: a pooled analysis from the AGRICOH consortium“. They looked at 316,270 farmers accruing 3,574,815 person-years of exposure to glyphosate and found no effect. This puts the inclusion of 99 rat pups in this study into perspective doesn’t it. By now a lot of you are likely asking: if the study had little chance of coming to a solid conclusion what is the point of this type of study? The simple answer is a pilot study is exactly that, a pilot study. You throw stuff at a wall to see if anything sticks. If something does stick then that is a good direction for further research. Due to its small sample size; massive number of potential comparisons; and lack of refinement all a pilot study of this type does is sets the project up to do a more directed study sometime later. Another research group can use the information from this study to design an experiment to see if the initial observed correlations can be repeated. Until those more-detailed studies are done, the results from this pilot study really tell us nothing useful about whether glyphosate is the cause of the observed changes or whether those numbers are simply the result of a random roll of the dice. As I finish this blog post I know the question I am going to be asked is: well did glyphosate have an effect or not? My response is: I don’t know and neither do the authors of this study. The study was not designed to answer that question and as such is unable to do so but rather opens up directions for future investigations. The only people who are going to express certainty about the outcome of this study are activists who will trumpet it as proof that glyphosate is a danger. Because of the study’s design it is virtually impossible to derive any positive or negative conclusions from the research but that won’t stop the activists or their friendly journalist friends who love a scary headline. All I can hope is that if enough observers understand the limitations of sample design and statistics they will call out the activists when they make these inaccurate statements. I have written a lot at this blog about how chemical risks are communicated to the public and so I am often asked about news stories depicting the latest science scare story. Sometimes they are handled badly, like the CTV National news report about glyphosate with the chilling title: Weed-killing chemical found in pasta, cereal and cookies sold in Canada: study. Sometimes it is done much better, like the Global New take on a similar topic with ‘Dirty Dozen’: Do these fruits and veggies really have harmful amounts of pesticide? As I will explain in this blog post, ultimately it comes down to understanding that we have to stop asking the question “can this compound cause cancer?” and instead ask: “is this compound expected to cause cancer at the concentrations encountered in that study?” because while the answer to that first question may be “yes”, the answer to the second will almost always be “no”. In asking those questions we can understand the fundamental difference between a hazard and a risk. As many of my readers know, one of my areas of professional practice is risk assessment. In my practice I often hear people interchange the words “hazard” and “risk“. These are not interchangeable terms. I can’t repeat this enough, the words “hazard” and “risk” mean very different things and it is important to understand that something can be a hazard without posing a serious risk. A risk is the likelihood that a hazard will cause harm. Notice the difference? An unfenced swimming pool is a hazard to toddlers. But if that unfenced swimming pool is on a fenced estate where toddlers are not allowed then it poses no risk to your toddler. So let’s bring this back to the idea of pesticides like glyphosate. Well by now we all know that the International Agency for Research on Cancer (IARC) has designated glyphosate as a Group 2A carcinogen meaning they believe it is “probably carcinogenic to humans”. There are very strong arguments that the IARC conclusion was incorrect and that glyphosate is likely not a carcinogen . The UN Food and Agriculture Organization and World Health Organization, the European Food Safety Authority (EFSA), Health Canada and the US EPA all agree on that the IARC is wrong. Strong articles have even been written to suggest the IARC decision was fundamentally flawed. The IARC Monographs Programme evaluates cancer hazards but not the risks associated with exposure. The distinction between hazard and risk is important. An agent is considered a cancer hazard if it is capable of causing cancer under some circumstances. Risk measures the probability that cancer will occur, taking into account the level of exposure to the agent. The Monographs Programme may identify cancer hazards even when risks are very low with known patterns of use or exposure [my bold]. Even in their own document the IARC explains that a pesticide can pose a hazard and not be a risk to human health. The other thing to understand is analytical chemists are really, really good at finding very small amounts of compounds in mixtures. As I pointed out in a previous post; analytical chemistry has got so precise that a modern mass spectrometer can distinguish to the parts per trillion range. That would be 1 second in 30,000 years. So when an activist says they found “detectable” concentrations of a pesticide in a sample you should probably take that with a grain of salt. Reading the two studies presented at the top of this blog they found pesticides in the parts per billion range. A part per billion would be a drop of water in an Olympic-sized swimming pool. In toxicology and risk assessment the way we determine whether an exposure to a chemical poses a risk is to calculate the reference dose, (RfD). A RfD is a concentration or dose of a compound in question to which a receptor may be exposed without causing adverse health effects (i.e. a dose that is considered “safe” or “acceptable”). For pesticides, Health Canada calculates maximum residue limits (MRL) that represent concentrations of a compound that are not considered to pose a significant risk to the public. the highest amount of glyphosate found was 760 ppb which is way, way below Health Canada’s standard for oat products at 15,000 ppb. A small child eating 100 grams of the cereal would consume 0.076 milligrams of glyphosate. Most regulatory agencies have concluded that consumption up to 0.5 mg/kg body weight per day presents no problem, so that a 10 kg child could consume 5 mg per day. The 0.076 mg consumed is 1/66th of this. That is, a 10 kg child (a baby) would have to eat 66 bowls of Cheerios a day to experience a detectable risk to their health. This brings us back to our story about fear-mongering and glyphosate. I can’t count the number of people on my social media feed who pointed out that a jury found Monsato guilty for causing a man’s cancer. Well I am not the first person, nor will I be the last, to point out that US juries are not known for their ability to understand science. Another jury once believed the story about an infamous glove “if it doesn’t fit, you must acquit” and we now all agree they were out to lunch. Instead of trusting US juries for our science I think we should stick with the professionals and they all agree (even the IARC) that the concentrations of glyphosate you encounter in your daily life in your breakfast cereals and in your nutritious fruits and vegetables are not high enough to cause any harm. In other words, while glyphosate may represent a theoretical hazard to human health it does not pose a real risk to you or your children. To conclude let me reiterate. When you see a study like those presented above do not ask: “can this compound cause cancer?“. Instead ask: “is this compound expected to cause cancer at the concentrations encountered in that study?” By doing so you will get the correct answer. Then you can ignore the fear mongers and go back to eating those healthy fruits and vegetables in peace. Because I deal with risk all the time in this blog I have prepared a series of posts to help explain the risk assessment process. The posts start with “Risk Assessment Methodologies Part 1: Understanding de minimis risk” which explains how the science of risk assessment establishes whether a compound is “toxic” and explains the importance of understanding dose/response relationships. It explains the concept of a de minims risk. That is a risk that is negligible and too small to be of societal concern (ref). The series continues with “Risk Assessment Methodologies Part 2: Understanding “Acceptable” Risk” which, as the title suggests, explains how to determine whether a risk is “acceptable”. I then go on to cover how a risk assessment is actually carried out in “Risk Assessment Methodologies Part 3: the Risk Assessment Process. I finish off the series by pointing out the danger of relying on anecdotes in a post titled: Risk Assessment Epilogue: Have a bad case of Anecdotes? Better call an Epidemiologist.